Hypertension remains one of the most important noncommunicable diseases in the present era. The number of adults with hypertension in 2025 is predicted to increase by about 50% to a total of 1.56 billion (1.54-1.58 billion). , Despite a good armamentarium of anti hypertensive drugs, quite a large number of patients remain undertreated and have poorly controlled blood pressure (BP). Resistant hypertension is defined as BP that remains above goal (i.e., systolic BP >140 and diastolic BP >90 mm Hg) in spite of the lifestyle modifications and concurrent use of three or more antihypertensive agents, prescribed in optimally targeted dosages, including one diuretic. Its prevalence is to the order of 20%-30% of all hypertensives and varies by population. , In a recent study of 2,05,750 hypertensive patients followed over 1.5 years, 1.9% developed resistant hypertension. Such patients are at increased risk of early cardiovascular, renal, and cerebrovascular complications implying the need for strict BP control. Polypharmacy strategies for uncontrolled BP are plagued by numerous problems like pill burden, noncompliance, multiple adverse effects, and increased cost. The development of novel procedures or devices for resistant hypertension is not necessarily based on the premise of failure of pharmaceutical strategies but rather on the potential of such novel approaches to selectively target organs or nerves without contending with the associated systemic effects of pharmaceutical strategies. These therapies are not being proposed to replace but to supplement existing pharmacotherapies with a goal to achieve safe and cost-effective control of BP. 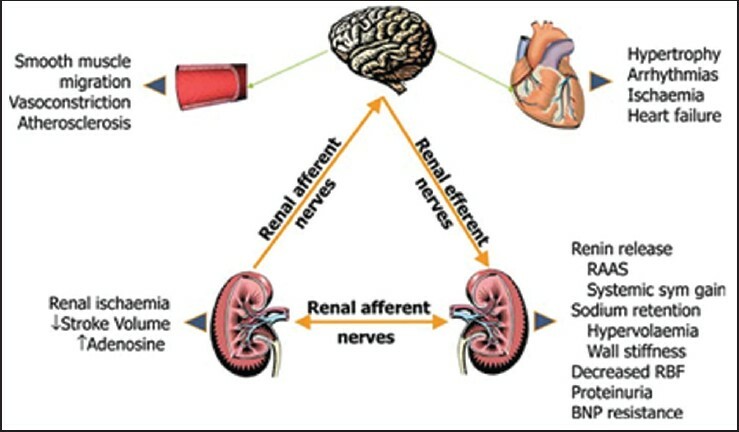 Both preclinical and human studies involving models of hypertension have convincingly demonstrated the key pathological role of renal sympathetic efferent and afferent nerve activity in the development and progression of hypertension. ,, Their convenient adventitial location makes them amenable for endovascular intervention. Sympathetic nervous system as the target for the treatment of hypertension had previously been explored. The procedure of sympathectomy has come into light once again with the introduction of catheter-based ablation technique to disrupt both of afferent and efferent renal nervous system. Three major endovascular strategies for RSD-radiofrequency ablation (RFA), ultrasonic ablation; and tissue directed pharmacological ablation are available. Of the many new percutaneous renal ablation system, five are approved in Europe- Medtronic's Symplicity system, St. Jude's EnligHTN system, Vessix's V2 system, Covidien's One Shot system, and Recor's Paradise system. All are RFA systems except Recor's ultrasound-based system. The maximum clinical experience is with Symplicity catheter system (discussed here as prototype). Meaningful reductions in BP may take weeks to months to occur implying resetting of sympathetic control. Hence, antihypertensive medications should be continued in postoperative period and titrated subsequently. Office BP should be regularly monitored at 1, 3, 6, 12, 24, and 36 months postprocedure. Apart from this ambulatory and home BP monitoring should also be checked at least at 6, 12, 24, and 36 months. ,, Renal artery imaging by computed tomography scan should be performed at 12 and 36 months following the renal denervation procedure. During follow-up visits, measurement of renal functions is also mandatory (serum creatinine, Estimated Glomerular Filteration Rate (e-GFR), and albuminuria). Two clinical trials (SYMPLICITY HTN1 & 2) have assessed the effects of RSD in patients who were resistant to conventional pharmacologic treatment as defined by the failure to achieve systolic BP <160 mm Hg (or <150 mm Hg in patients with diabetes) despite adequate doses of at least three antihypertensive drugs. 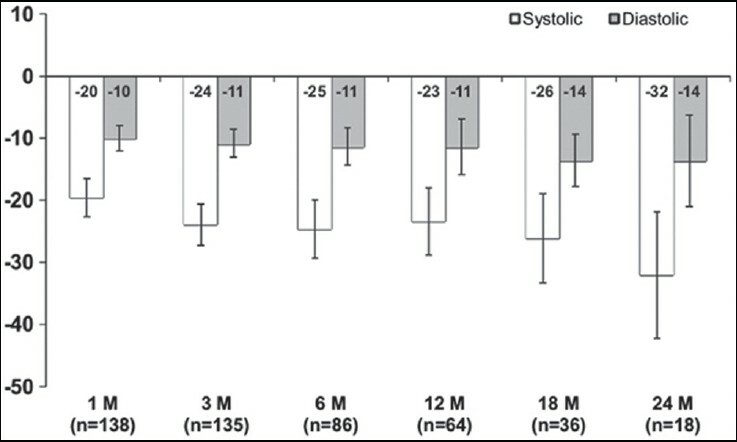 SYMPLICITY HTN-1 was an observational first-in-human evaluation of the safety and BP-lowering efficacy of selective RSD in patients with resistant hypertension. A total of 45 consecutive patients (mean age 58 ± 9 years) with a mean BP of 177/101 ± 20/15 mm Hg were included. Patients were on a mean of 4.7 ± 1.5 antihypertensive drugs. The procedure was associated with significant reduction in both systolic and diastolic office BPs at 1, 3, 6, 9, and 12 months, with mean decreases in office BP of −14/10 ± 4/3, -21/10 ± 7/4, −22/11 ± 10/5, −24/11 ± 9/5, and −27/ 17 ± 16/11 mm Hg, respectively. Radiotracer dilution analyses from 10 patients revealed a substantial reduction in mean NE spillover of 47% (95% confidence interval: 28% to 65%) at 1 month after bilateral denervation [Figure 3]. Muscle sympathetic nerve activity studies suggested a reduction in afferent sympathetic activity, that is, reduced central sympathetic drive [Figure 4]. In 13% of patients, no favorable BP response occurred. 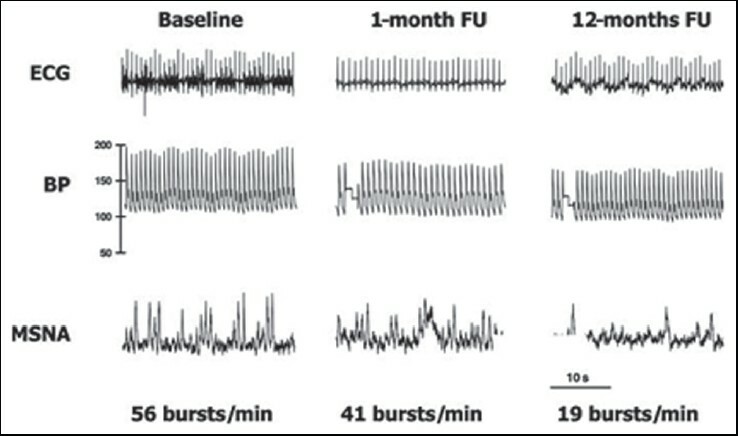 Furthermore, at 1-year follow-up, there was evidence of normalization of sympathetic nerve firing rates, accompanied by a reduced left ventricular (LV) mass and a decreased requirement for antihypertensive medication. SYMPLICITY HTN1 was a proof of concept study without control group. SYMPLICTIY HTN 2 study though randomized was not blinded. Both the trials had relatively small sample size and highly selected population groups were enrolled. The follow-up data are available only up to3 years which precludes risk assessment for infrequent or long-term adverse events. Similar to the first study, the Symplicity HTN-2 trial did not clearly define the 'resistant hypertension' either, and did not exclude the possibilities such as secondary hypertension. Only patients with renal arteries with an anatomy favorable to catheter-based therapy (minimal length of 20 mm allowing an adequate landing zone and minimal diameter of 4 mm) were included. ABPM data were not available for all patients and effects of RSD on ambulatory BP monitoring (ABPM) values were less impressive. SYMPLICITY HTN 3 is large, randomized, single-blinded, multicenter trial currently underway to address some of these concerns. The inclusion criteria are very similar to those of Symplicity HTN-2, with even more stringent medication requirements. About 530 patients with resistant hypertension will be randomized in a 2:1 ratio to undergo either RSD or a sham procedure. Additionally, all subjects will undergo ABPM. Multielectrode basket design of the EnligHTN catheter (St. Jude Medical Inc., St. Paul, Minnesota, USA) allows for simultaneous energy delivery to four sites along the endoluminalsurface of the artery, with a potential benefit of reducing renal denervation procedural time. EnligHTN-I was first-in-human study was designed to assess the safety and efficacy of this multielectrode ablation system in patients with drug-resistant hypertension. At 12 months, 80% of patients were responders, 75% had office BP <160 systolic, and 29% had normalized BP. Average reductions (mm Hg) of office BP at 1, 3, 6, and 12 months were −28/10, −27/10, −26/10, and −27/11 mmHg (P < 0.001), respectively and for 24 h ambulatory BP -10/5, −10/5, and −10/6 mm Hg (P < 0.001). The Vessix V2 renal denervation system (Vessix Vascular Inc., Laguna Hills, California) offers a unique, over-the-wire low-pressure balloon equipped with bipolar RFA electrodes attached to the balloon surface. It offers lower treatment times and can accommodated smaller diameter renal arteries. Interim data of 139 patients of REDUCE-HTN trial, using Vessix system presented at TCT 2013, demonstrated a significant 24.6 mm Hg reduction in systolic BP (P < 0.0001) at 6 months and sustained 29.6 mm Hg reduction in systolic BP in the subset of patients for whom 12-month data are available. A clinically-meaningful decrease in office BP at both 6 and 12 months was seen in 85% of patients. In a study of 50 patients with resistant hypertension by Mahfoud et al.,  RSD resulted in significantly decreased BP along with improvement in glucose metabolism and insulin sensitivity by decreasing insulin and C-peptide levels. A pilot study of seven patients with chronic mild to moderate systolic heart failure demonstrated a mild improvement in 6-min walking distance, while ejection fraction and other cardiac structural and functional changes were not changed significantly after 6 months. RE-ADAPT-CHF, a randomized trial is investigating the effects of renal denervation in 100 patients with chronic heart failure (New York Heart Association functional class II-III). RSD has been shown to significantly reduce the resting heart rate in patients with resistant hypertension and prolonged PR interval. Also, as a first-in-human experience RSD was used as bailout therapy in two patients with congestive heart failure suffering from treatment-resistant electrical storm. Pokushalov et al.,  in a recent study of 27 patients reported that RSD reduced AF recurrence when combined with pulmonary vein isolation (PVI). 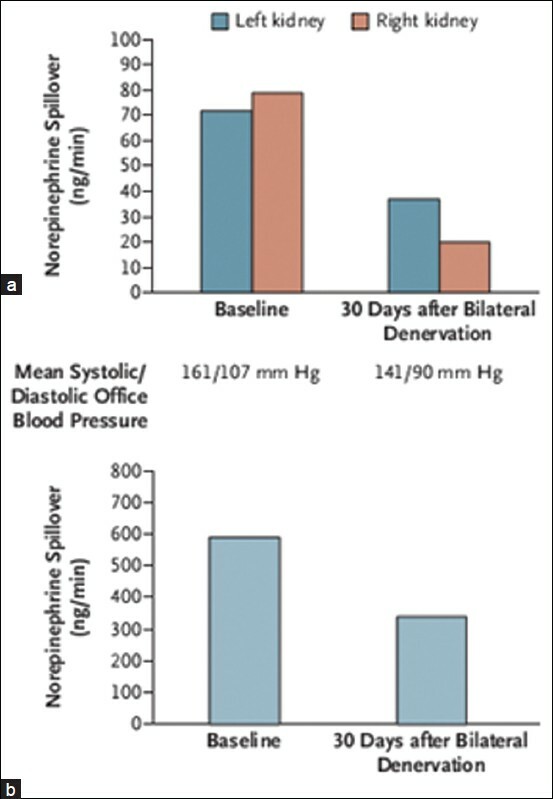 Based primarily on the results of SYMPLICTY HTN trials, RSD therapy should be offered only to severe treatment resistant hypertension defined as-office systolic BP >160 mm Hg (≥150 mm Hg in type 2 diabetes) despite treatment with at least three antihypertensive drugs of different types in adequate doses, including one diuretic. ,, An ambulatory BP monitoring is mandatory to exclude pseudoresistance. Before embarking upon renal denervation, lifestyle modification, drug compliance, and secondary causes of hypertension should be looked into. Whether it is mandatory for patients should undergo a trial of mineralocorticoid antagonist before RSD is debatable. At present, only patients with preserved renal function (GFR ≥ 45 mL/ min per 1.73 m 2 ) should undergo the procedure. At 6 months, both studies found office BP reduction in range of 13/5-7 mm Hg. Similar reductions in ambulatory BP recordings were also observed. Hypertension is having a global pandemic. Despite adequate pharmacotherapy a substantial number of patients fail to attain target BP goals and are at subsequent risk of cardiovascular events. Modulation of sympathetic system is now emerging as a novel avenue for non pharmacological therapy of hypertension. Catheter-based RFA of renal sympathetic nerves has moved from bench to bedside as safe and cost effective tool for management of resistant hypertension. Evidence from clinical trials has clearly depicted that RSD attains significant and sustained BP lowering effects in resistant hypertension up to 36 months. Apart from BP control RSD also has been shown to be effective in improving glucose homeostasis, sleep apnea, heart failure, arrhythmia, and end-stage renal disease. After the successful trials of prototype Symplicity renal denervation system, four other novel catheter systems are now CE marked in Europe for clinical use. Though at present indicated for severe treatment resistant hypertension (systolic BP >160 mm Hg) with a suitable renal anatomy, data are now merging also for RSD in lesser severe forms of drug resistant hypertension too. The technology for RSD is evolving with persistent endeavor toward making it more easy, safe, and patient friendly. RSD promises to be a one stop and possibly permanent cure for hypertension in future. 1. Chobanian AV, Bakris GL, Black HR, Cushman WC, Green LA, Izzo JL Jr, et al. National Heart, Lung, and Blood Institute Joint National Committee on Prevention, Detection, Evaluation, and Treatment of High Blood Pressure, National High Blood Pressure Education Program Coordinating Committee. The seventh report of the joint national committee on prevention, detection, evaluation, and treatment of high blood pressure: The JNC report. JAMA 2003;289:2560-72. 2. Kearney PM, Whelton M, Reynolds K, Muntner P, Whelton PK, He J. Global burden of hypertension: Analysis of worldwide data. Lancet 2005;365:217-23. 3. Calhoun DA, Jones D, Textor S, Goff DC, Murphy TP, Toto RD, et al. Resistant hypertension: Diagnosis, evaluation, and treatment. A scientific statement from the American Heart Association Professional Education Committee of the Council for High Blood Pressure Research. Hypertension 2008;51:1403-19. 4. Sarafidis PA, Bakris GL. Resistant hypertension. An overview of evaluation and treatment. J Am Coll Cardiol 2008;52:1749-57. 5. Daugherty SL, Powers JD, Magid DJ, Tavel HM, Masoudi FA, Margolis KL, et al. Incidence and prognosis of resistant hypertension in hypertensive patients. Circulation 2012;125:1635-42. 6. Quinby WC. The function of the kidney when deprived of its nerves. J Exp Med 1916;23:535-48. 7. Kottke FJ, Kubicek WG, Visscher MB. The production of arterial hypertension by chronic renal artery-nerve stimulation. Am J Physiol 1945;145:38-47. 8. Smith PA, Graham LN, Mackintosh AF, Stoker JB, Mary DA. Relationship between central sympathetic activity and stages of human hypertension. Am J Hypertens 2004;17:217-22. 9. Barajas L, Liu L, Powers K. Anatomy of the renal innervation: Intrarenal aspects and ganglia of origin. Can J Physiol Pharmacol 1992;70:735-49. 10. DiBona GF, Esler M. Translational medicine: The antihypertensive effect of renal denervation. Am J Physiol Regul Integr Comp Physiol 2010;298:245-53. 11. Abramczyk P, Zwolinska A, Oficjalski P, Przybylski J. Kidney denervation combined with elimination of adrenal-renal portal circulation prevents the development of hypertension in spontaneously hypertensive rats. Clin Exp Pharmacol Physiol 1999;26:32-4. 12. Rippy MK, Zarins D, Barman NC, Wu A, Duncan KL, Zarins CK. Catheter-based renal sympathetic denervation: Chronic preclinical evidence for renal artery safety. Clin Res Cardiol 2011;100:1095-101. 13. Esler M. The sympathetic system and hypertension. Am J Hypertens 2000;13:99-105S. 14. Papademetriou V, Doumas M, Tsioufis K. Renal sympathetic denervation for the treatment of difficult-to-control or resistant hypertension. Int J Hypertens 2011;2011:196518. 15. Esler M, Jennings G, Lambert G. Noradrenaline release and the pathophysiology of primary human hypertension. Am J Hypertens 1989;2:140-6S. 16. Converse RL Jr, Jacobsen TN, Toto RD, Jost CM, Cosentino F, Fouad-Tarazi F, et al. Sympathetic overactivity in patients with chronic renal failure. N Engl J Med 1992;327:1912-8. 17. Schlaich MP, Lambert E, Kaye DM, Krozowski Z, Campbell DJ, Lambert G, et al. Sympathetic augmentation in hypertension: Role of nerve firing, norepinephrine reuptake, and angiotensin neuromodulation. Hypertension 2004;43:169-75. 18. Smithwick RH, Thompson JE. Splanchnicectomy for essential hypertension; results in 1,266 cases. J Am Med Assoc 1953;152:1501-4. 19. Morrissey DM, Brookes VS, Cooke WT. Sympathectomy in the treatment of hypertension; review of 122 cases. Lancet 1953;1:403-8. 20. Bisognano JD, Barkis G, Nadim MK, Sanchez L, Kroon AA, Schafer J, et al. Baroreceptor activation lowers blood pressure in patients with resistant hypertension; Results from the Rheos Pivotal trial. J Am Coll Cardiol 2011;58:765-73. 21. Krum H, Schlaich M, Sobotka P, Scheffers I, Kroon AA, de Leeuw PW. Novel procedure- and device-based strategies in the management of systemic hypertension. Eur Heart J 2011;32:537-44. 23. Patel NK, Javed S, Khan S, Papouchado M, Malizia AL, Pickering AE, et al. Deep brain stimulation relieves refractory hypertension. Neurology 2011;76:405-7. 24. Bunte MC, Infante de Oliveira E, Shishehbor MH. Endovascular treatment of resistant and uncontrolled hypertension: Therapies on horizon. JACC Cardiovasc Interv 2013;6:1-9. 25. Sudano I, Mahoud F. Renal nerve ablation for treatment of therapy-resistant hypertension. Eur Heart J 2013;34:865-8. 26. Krum H, Schlaich M, Whitbourn R, Sobotka PA, Sadowski J, Bartus K, et al. Catheter-based renal sympathetic denervation for resistant hypertension: A multicentre safety and proof-of-principle cohort study. Lancet 2009;373:1275-81. 27. Steigerwald K, Titova A, Malle C, Kennerknecht E, Jilek C, Hausleiter J, et al. Morphological assessment of renal arteries after radiofrequency catheter-based sympathetic denervation in a porcine model. J Hypertens 2012;30:2230-9. 28. Templin C, Jaguszewski M, Ghadri JR, Sudano I, Gaehwiler R, Hellermann JP, et al. Vascular lesions induced by renal nerve ablation as assessed by optical coherence tomography: Pre- and post-procedural comparison with the Simplicity_ catheter system and the EnligHTN multi-electrode renal denervation catheter. Eur Heart J 2013;34:2141-8. 29. Mahfoud F, Luscher TF, Andersson B, Baumgartner I, Cifkova R, Dimario C, et al. European Society of Cardiology. Expert consensus document from the European Society of Cardiology on catheter-based renal denervation. Eur Heart J 2013;34:2149-57. 30. Schlaich MP, Schmieder RE, Bakris G, Blankestijn PJ, Böhm M, Campese VM, et al. International expert consensus statement: Percutaneous transluminal renal denervation for the treatment of resistant hypertension. J Am Coll Cardiol 2013;62:2031-45. 31. Pathak A, Girerd X, Azizi M, Benamer H, Halimi JM, Lantelme P, et al. Expert consensus: Renal denervation for the treatment of arterial hypertension. Arch Cardiovasc Dis 2012;105:386-93. 32. Symplicity HTN-1 Investigators. Catheter-based renal sympathetic denervation for resistant hypertension: Durability of blood pressure reduction out to 24 months. Hypertension 2011;57:911-7. 33. Krum H, Schlaich M, Sobotka PA, Esler MD, Mahfoud F, Bo¨hm M, et al. TCT-12 long-termfollow-up of catheter-based renal denervation for resistant hypertension confirms durable blood pressure reduction. J Am Coll Cardiol 2012;60. 34. Carlstedt T, Dalsgaard CJ, Molander C. Regrowth of lesioned dorsal root nerve fibers into the spinal cord of neonatal rats. Neurosci Lett 1987;74:14-8. 35. Esler MD, Krum H, Sobotka PA, Schlaich MP, Schmieder RE, Bohm M. Symplicity HTN-2 Investigators. Renal sympathetic denervation in patients with treatment-resistant hypertension (The Symplicity HTN-2 Trial): A randomized controlled trial. Lancet 2010;376:1903-9. 36. Esler MD, Krum H, Schlaich M, Schmieder RE, Bohm M, Sobotka PA. Symplicity HTN-2 Investigators. Renal sympathetic denervation for treatment of drug resistant hypertension: one-year results from the Symplicity HTN-2 randomized, controlled trial. Circulation 2012;126:2976-82. 37. Kandzari DE, Bhatt DL, Sobotka PA, O'Neill WW, Esler M, Flack JM, et al. Catheter-based renal denervation for resistant hypertension: Rationale and design of the Symplicity HTN-3 trial. Clin Cardiol 2012;35:528-35. 38. Papademetriou V, Worthley S, Tsioufis C, Worthley M, Chew D, Sinhal A, et al. Catheter-based renal denervation for the treatment of patients with drug-resistant hypertension: EnligHTN I: Three-month data of a first in man study using a multi-electrode radiofrequency ablation catheter. Circulation 2012;125:19523. 39. Papademetriou V, Tsioufis C, Worthley M, Chew D, Sinhal A, Meredith I, et al. Long Term Safety and Efficacy of a multi-electrode renal artery denervation catheter in patients with drug-resistant hypertension: Twelve and 18 Month Results of a First-in-Human, Multicenter Study. Circulation 2013;128:15050. 40. Hoppe U. 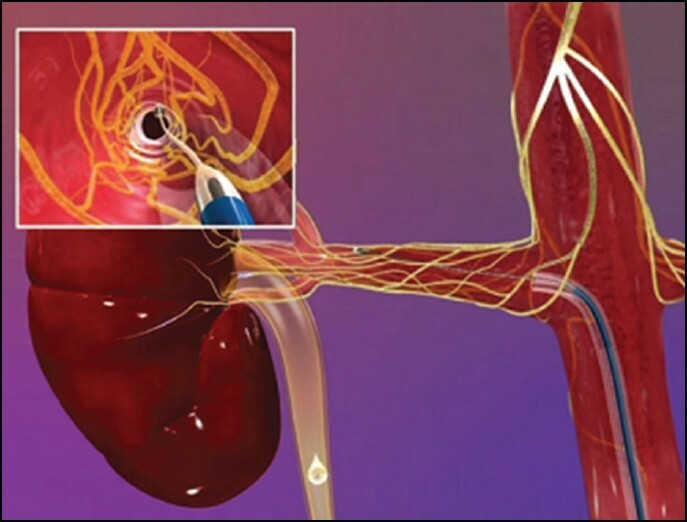 Clinical experience with Vessix Vascular balloon renal denervation catheter. Abstract presented at the 2012 Annual Scientific Sessions of the European Association for Percutaneous Cardiovascular Interventions. Paris: France; 2012. 42. Mabin T, Sapoval M, Cabane V, Stemmett J, Iyer M. First experience with endovascular ultrasound renal denervation for the treatment of resistant hypertension. Eurointervention 2012;8:57-61. 43. Mahfoud F, Kjeldsen SE. Catheter-based renal denervation: A word of caution. Eurointervention 2013;8. 44. Brandt CM, Mahfoud F, Reda S, Schirmer SH, Erdmann E, Böhm M, et al. Renal sympathetic denervation reduces left ventricular hypertrophy and improves cardiac function in patients with resistant hypertension. J Am Coll Cardiol 2012;59:901-9. 45. Mahfoud F, Schlaich M, Kindermann I, Ukena C, Cremers B, Brandt MC, et al. Effect of renal sympathetic denervation on glucose metabolism in patients with resistant hypertension: A pilot study. Circulation 2011;123:1940-6. 46. Witkowski A, Prejbisz A, Florczak E, K¹dziela J, ?liwiñski P, Bieleñ P, et al . Effects of renal sympathetic denervation on blood pressure, sleep apnea course, and glycemic control in patients with resistant hypertension and sleep apnea. Hypertension 2011;58:559-65. 47. Davies JE, Manisty CH, Petraco R, Barron AJ, Unsworth B, Mayet J, et al. First-in-man safety evaluation of renal denervation for chronic systolic heart failure: Primary outcome from REACH-Pilot study. Int J Cardiol 2013;162:189-92. 48. Hering D, Mahfoud F, Walton AS, Krum H, Lambert GW, Lambert EA, et al. Renal denervation in moderate to severe CKD. J Am Soc Nephrol 2012;23:1250-7. 49. Schlaich MP, Bart B, Hering D, Walton A, Marusic P, Mahfoud F, et al. Feasibility of catheter-based renal nerve ablation and effects on sympathetic nerve activity and blood pressure in patients with end-stage renal disease. Int J Cardiol 2013;168:2214-20. 50. Ukena C, Mahfoud F, Spies A, Kindermann I, Linz D, Cremers B, et al. Effects of renal sympathetic denervation on heart rate and atrioventricular conduction in patients with resistant hypertension. Int J Cardiol 2013;167:2846-51. 51. Ukena C, Bauer A, Mahfoud F, Schreieck J, Neuberger HR, Eick C, et al. Renal sympathetic denervation for treatment of electrical storm: First-in-man experience. Clin Res Cardiol 2012;101:63-7. 52. Pokushalov E, Romanov A, Corbucci G, Artyomenko S, Baranova V, Turov A, et al. A randomized comparison of pulmonary vein isolation with versus without concomitant renal artery denervation in patients with refractory symptomatic atrial fibrillation and resistant hypertension. J Am Coll Cardiol 2012;60:1163-70. 53. Ott C, Mahfoud F, Schmid A, Ditting T, Sobotka PA, Veelken R, et al. Renal denervation in moderate treatment resistant hypertension. J Am Coll Cardiol 2013;62:1880-6. 54. Kaltenbach B, Franke J, Bertog SC, Steinberg DH, Hofmann I, Sievert H. Renal sympathetic denervation as second-line therapy in mild resistant hypertension: A pilot study. Catheter Cardiovasc Interv 2013;81:335-9. 55. Geisler BP, Egan BM, Cohen JT, Garner AM, Akehurst RL, Esler MD, et al. Cost-effectiveness and clinical effectiveness of catheter-based renal denervation for resistant hypertension. J Am Coll Cardiol 2012;60:1271-7. 56. Mancia G, Fagard R, Narkiewicz K, Redón J, Zanchetti A, Böhm M, et al. 2013 ESH/ESC Guidelines for the management of arterial hypertension: The Task Force for the management of arterial hypertension of the European Society of Hypertension (ESH) and of the European Society of Cardiology (ESC). Eur Heart J 2013;31:1281-357.